Looking for somewhere new and exciting to call home? Look no further than Thurrock. We are located on the north shore of the River Thames, just a short stone's throw to the east of London, and Essex to the north and west. Our location offers the best of all worlds, with lively towns and peaceful villages surrounded by acres of parks, countryside and heritage sites. Thurrock's character is interwoven with that of the Thames. We have 2 magnificent forts – Tilbury fort and Coalhouse fort – that overlook the river, with a network of footpaths connecting centuries of history. Our population is diverse, with a mix of nationalities living across our towns and villages. Massive investment and growth is bringing new jobs and opportunities to the area. For shoppers, we have 3 huge malls within easy reach – Lakeside in Thurrock, Bluewater and Westfield Stratford. 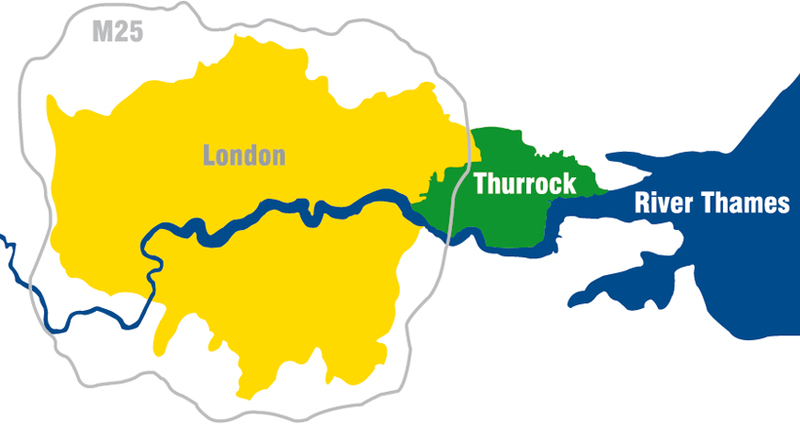 Whilst London is directly on our eastern border, Thurrock itself is not as built-up. Behind our 18 miles of riverfront we have a varied green belt that covers 70% of the borough. Those who prefer unspoilt countryside will enjoy our 2 nature reserves – Rainham Marshes Nature Reserve and Thameside Nature Park – along with many other open parks and woodlands. Thurrock can offer you a great quality of life. Join us in Thurrock to grow your career and put down roots in our community.